Some months ago, Bool Smuts of the Landmark Foundation, which promotes non-lethal predator controls on livestock farms, caused a stir when through his e-mail newsletters circulated in South Africa and abroad, he asked his readers to protest against the presence of a factory producing gin traps in Prince Albert.In this edition, three players in the gin trap debate present their points of view. We at the Landmark Foundation believe that gin traps, leg hold devices, such as snares, indiscriminate poison traps and hunting dog packs as methods of predator control on livestock farms are barbaric practices that should be outlawed immediately.These methods are indiscriminate, cruel and ecologically damaging and have proven ineffectual. We actively promote efforts that are non-lethal, ecologically and socially acceptable, humane and demonstrably more effective. Traps have been banned in 90 countries, but are still advanced in South Africa by academics, agricultural institutions, government departments and even some conservation agencies. We have a responsibility to care for all living creatures in ethical ways.There is no moral defence for the unselective torture and destruction of wild animals sharing the environment with livestock. For centuries dedicated predator persecution has failed to resolve the problem for farmers and many admit livestock losses from predation have increased in recent years, despite increased use of lethal controls. Modern farmers understand the futility of fighting against nature and are turning to holistic and non-lethal management practices that are far more efficient, cost effective and acceptable. It is important to understand and respect the value of predators. Within the food pyramid they function at the top, playing a critical role in the health and dynamic balance of the ecosystem by managing prey populations. Natural harmony has been dramatically altered by the impact of agriculture. Livestock is inevitably targeted as prey. Inappropriate farm management systems have disrupted the balance of various predators and natural prey populations thereby exacerbating the problem. Certain predator species have been reduced to the brink of extinction (leopard) while others (caracal and jackal) have multiplied disproportionately through indiscriminate killing. Predators balance their own numbers better than any efforts of humans, especially through lethal controls as has been demonstrated in recent research on jackal and leopards. It is actually the lethal controls that are increasing numbers of secondary predators such as jackal and caracal. We need to protect predators in their natural role to optimize integrity of the environment and preserve our natural heritage. More consumers are demanding the implementation of holistic, ethical and ecologically acceptable practices by choosing products that are environmentally and ethically sound, and they are prepared to pay for it. Extra earnings for farmers offset the losses to predation to make economic sense. Over the past year we have demonstrated dramatic success using only stipulated non-lethal control methods in the entire Baviaanskloof area with the full co-operation of neighbouring farmers. Since the implementation covering 13 000 small livestock animals, less than 10 individual losses attributed to predators have been reported.Recently farmers and the local community staged a public and symbolic burning of 160 gin traps to signify their confidence in the positive change. So it was with sadness and anger that I left the beautiful and peaceful town of Prince Albert some months ago where a factory is quietly manufacturing up to 1 200 gin traps a month, two hundred of which are leopard traps - it is illegal to use these devices on protected species. The factory owner, Peter Schneekluth, boasts 3 000 farmers on his books, which means up to 15 000 of his traps enter the system each year. I wonder how the Prince Albert Tourism Association and the town’s political leadership explain such an anomaly to the tourists and other visitors to their unique town? While in Prince Albert I was also struck by the unusual and fanciful art work of Kevin Hough and his gallery on the main street.I look forward to the day when gin traps are rejected by everyone and he can transform them into unique sculptures and memorials. Bool Smuts heads the Landmark Foundation. Jan van Riebeeck se dagboeke is vol verwysings na roofdiere wat die VOC se kuddes verwoes het. In Karel Schoeman se boek Armosyn van die Kaap lees ‘n mens die volgende aanhaling: ”…in dieselfde tydperk kon die vryswarte, Jan van Cylon, egter nog geld verdien met die skiet van leeus en luiperds in die omliggende klowe (van Stellenbosch) en in 1712 het hy 24 gulden ontvang vir die eerste leeu van die jaar”. En nou, bykans 300 jaar later, het niks verander nie. Honderde jagters, deeltyds en voltyds, van Khoi, Xhosa, Sotho en Europese afkoms, verkry hul inkomste, net soos ene Jan van Cylon, uit die jag van roofdiere. Ten spyte van dié groot jagpoging, word jaarliks nog ‘n verbysterende 800,000 tot ‘n miljoen stuks vee deur roofdiere gedood en verskeur (dis meer as 2,000 stuks vee per dag!) Feitlik die hele groter roofdierspektrum (jakkalse, rooikatte, rondloperhonde, luiperds, strandwolwe, draaijakkalse, sekere muishonde, otters, ratels, bosvarke en bobbejane) sak op ons kwesbare skape en bokke toe, want hulle het nòg kloue nòg slagtande nòg die mentaliteit om terug te veg - dus moet die mens sy skape beskerm wat hy dan ook met mening doen, want sy bestaan hang van die welvaart van sy vee af. There is a quiet, never-ending kind of low-level “guerilla warfare” going on, in the Karoo and elsewhere, to fight tough and resourceful predators in an attempt to contain stock losses. Farmers employ a wide variety of methods to do so. One of the more important ones is the gin trap (slagyster). That is unfortunate, because the gin is a cruel device. How cruel, has been aptly described by the great English writer Thomas Hardy in his novel The Woodlander about 120 years ago. Yes, and I am the person who manufactures them, and - Prince Albert is the place. And now activists, always eager to identify a cause to fight for, have found my factory, the “Place of Evil”. The discoverer was Dr. Bool Smuts (a non- practicing medical doctor) of the Landmark Foundation. On 16 th of July he entered my premises under false pretenses and under the name of Dave Mills, talked his way into the factory, charmed my staff, took photos and purchased traps. A few weeks later I received a flood of toxic e-mails. The vilest language was used, mostly written by “ladies”. The mails also revealed an utter ignorance about the dreadful sheep/predator situation, and all writers lamented the fate of jackal, and not a word of pity for our sheep. However, some of the more balanced writers suggested some alternative, non-lethal (ethical) methods such as the use of Anatolian guard dogs, protective collars, alpacas and donkeys. The problem with these methods is, unfortunately, that they work only under certain favourable conditions. If they would work as well as activists claim, farmers would have adopted them long ago, and my trap factory would have had to close down. Farmers would only be too glad to dispose of traps, because trap-work is expensive, cruel, extremely labor intensive and highly frustrating, but - gin traps are often the last line of defence, the final weapon when all else fails. In other words, as long as there is not a viable alternative to gin traps, they will be used, banned or un-banned. Instead of always criticizing, activists should pool their considerable resourses and develop an alternative to the cruel trap. Instead, Dr. “Dave Mills” incites his followers to threaten Prince Albert’s tourist industry with a boycott, unless this industry, with the backing of PA Municipality, throws me, and my “Evil Place”, out of town, tarred and feathered. This is blackmail and conceitedness combined, and that from an outsider via the internet. And, in doing so, “Dave Mills” is creating discontent in our town. It is not the first time that I have crossed swords with activists, and often wondered what is feeding their obsession. Taylor Caldwell has summed them up in her book The Beautiful is Vanished: “But there were others, I could pick them out, I knew them in a way. I could see these others were unsuccessful professional men, lawyers perhaps, or doctors, school teachers, newspaper people. Or should I say, they felt they were unsuccessful, that they deserved more…people who lacked the capacity to succeed in a major way as their fellow professional men had succeeded”. Peter Schneekluth manufactures gin traps in Prince Albert. As ‘n kleinveeboer is ek en die arbeiders wat saam met my boer se enigste bron van inkomste -- kleinvee. Ons bestuur die skape en bokke op lewensonderhoudende en lewensskeppende wyses sodat hulle gesond is, kan vermeerder en wol en bokhaar produseer. Die produkte verkoop ons dan en lewe van die inkomste. Verloor ons die skape en bokke, verloor ons die fondasie van ons lewensonderhoud. Erger as wat ‘n diereliefhebber sy troeteldier liefhet, het ons ons skape en bokke lief – ons lewens hier op die plaas word deur hulle welstand gewaarborg. Boklammers wat honger agter hul ma’s aanloop omdat hulle nie kan soog nie omdat ‘n roofdier hul bekkies en tonge afgevreet het. Boklammers waarvan die ore en sterte stomp afgevreet is. Skaaplammers waarvan die boudspier uitgevreet is sodat hul beswaarlik kan loop. Dorperooie waarvan die ingewande op die grond sleep as sy loop nadat ‘n jakkals haar buik op haar sy oopgeskeur het. Lammers wat doodgewurg lê, maar nie aan geëet is nie. As gevolg van boerdery eenhede (plase) wat al groter moet word omdat produktepryse elke jaar 3% minder styg as ons insetkostes, raak die beheer van roofdiere moeiliker en neem hul getalle kommerwekkend toe. Alle metodes van roofdiere afskrik, lammers beskerm tot die skuldige roofdiere elimineer word gebruik ons om ons kleinveekuddes te beskerm. Om roofdiere te elimineer is nodig indien die verminkings en slagtings nie gestop kan word nie. Daarvoor het ons die beproefde metodes nodig wat al eeue lank gebruik word om die probleem te beheer. Slagysters word as die laaste uitweg gebruik om sulke wrede roofdiere selektief mee weg te neem. Kleinvee is al waarmee ons in die ekstensiewe dele van ons distrik en land kan boer- moet asseblief nie die verminking van ons skape en bokke laat toeneem deur slag-ysters te verban nie. Diere is ons lewe !! Joseph Steyn, boer op die plaas Riet-fontein buite Prince Albert. With all your education of the subject do you have any real experiance on a farm with these animals? 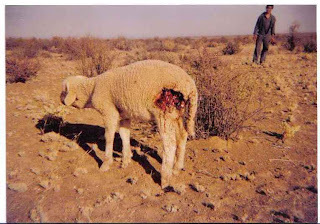 you dont walk around your fields looking for your lost lambs and finding them ripped to pieces with jackal spore everywhere, you can trace the spore back to where the jackal made the kill and dragged the lamb to it's final reasting place. please stop trying to convince people that jackals dont kill! ofcourse they do! we have loads of 'natural prey' on our farm - but a young lamb is easier to catch than a speedy mouse or a dassie on the rockface. sheep dont have afterbirth pouring out of them constantly to keep jackals at bay and jackals have the strenth and ability to hunt so what makes you think they wouldnt? put the textbook down and go have a real look at what is going on!